We are interested in understanding the molecular basis of biological electron transfer during cellular energy tranduction in photosynthesis and respiration. These basic metabolic pathways contain several multisubunit, membrane-bound protein complexes with various redox-active prosthetic groups. They are vital components for important cellular functions ranging from ATP synthesis to secretion, solute transport, motility and thermogenesis. Their dysfunction severely compromises cellular energy production, and leads to low crop yields in plants (photosynthesis), or neurological and muscular diseases in humans (respiration). A detailed understanding of how these evolutionarily well-conserved energy producing molecular machines perform their functions is of considerable biological significance and of general interest. Our studies aim to define the structure, function, assembly, biogenesis and regulation of these proteins in response to environmental signals, such as light and oxygen. Cytochrome bc1 complex and cytochrome cbb3 oxidase, which are membrane-associated proton bumps, and their physiological electron carriers the cytochromes c2 and cy are currently under study. Figure 1. Overview of Cu delivery pathway to cbb3-type cytochrome c oxidase. 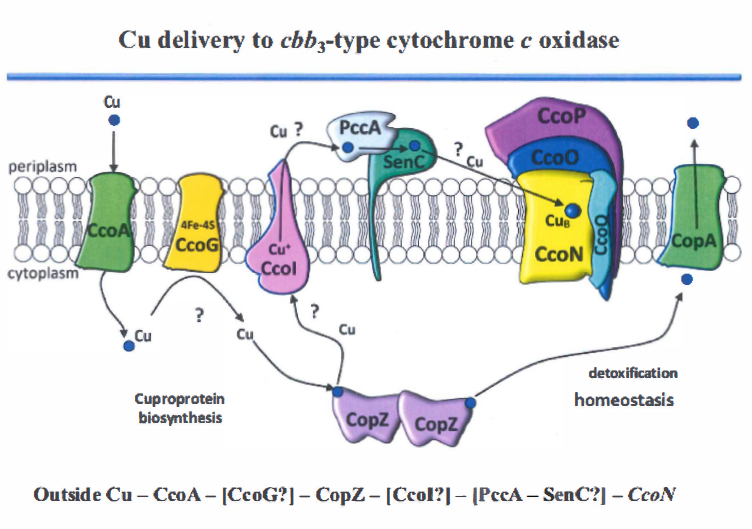 Environmental copper (Cu) is imported into the cytoplasm by CcoA, and on its way is likely to be reduced by CcoG, and then conveyed to CopZ, a cytoplasmic Cu chaperone. CopZ donates Cu to two P1B type Cu-ATPases, Ccol for biosyntesis of cbb3-type cytochrome c oxidase, and to CopA for detoxification and cellular Cu homeostasis. Periplasmi Cu chaperones PccA and SenC work together to ultimately convery Cu to the CcoN subunit of the cbb3-type cytochrome c oxidase during its biogenesis? Refers to steps that are under investigation. We use molecular genetic and genomic approaches combined with biochemical, biophysical and structural techniques. As a model system, we use the purple non-sulfur photosynthetic bacterium Rhodobacter capsulatus instead of mitochondria of eukaryotes or chloroplasts of plants which are more refractory to multidisciplinary analyses. Current work is focused on the 1) structure and function of the functional sites of the cytochrome complexes and the assembly of their subunits and 2) biogenesis of c-type cytochromes including cyt cy and cyt cbb3 which are novel membrane-associated electron carriers recently discovered in our group. Figure 2. 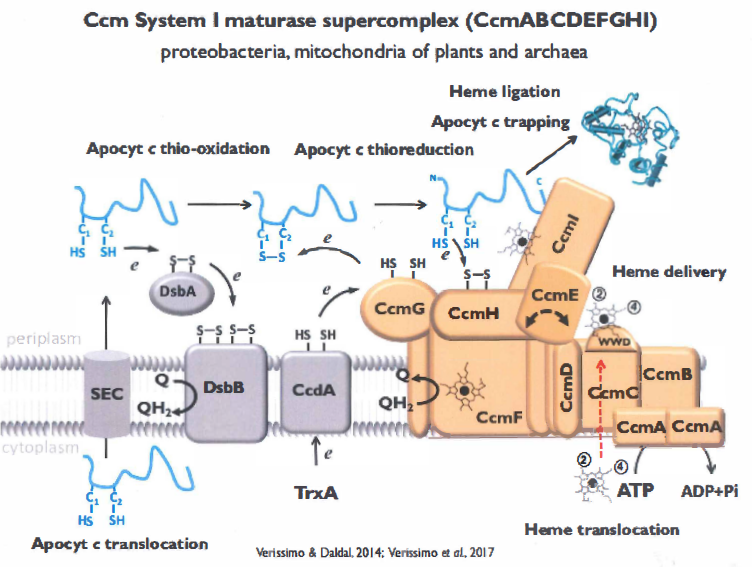 Overview of cytochrome c maturation System I (CcmABCDEFGHI) supercomplex. Apocytochromes c are translated in the cytoplasm and excreted to the periplasm via the Sec translocon. They are exposed to the oxidative folding pathway for proteins (DsbA and DsbB) to gain their disulfide bond at their conserved CysXxxXxxCysHis heme ligation motifs. This disulfide bond is reduced by the thioreductive pathway (CcdA and CcmG), and reduced apocytochromes c are trapped via thier C-terminal ends by Ccml. Subsequently they form a mixed disulfide bond with CcmH in a stereospecific manner to allow the thioether bond formation by the heme ligation complex CcmFHI between their free C-terminal Cys and the vinyl-4 of heme held by CcmE. Concurently, heme is biosynthesized on the inner surface of the cytoplasmic membrane, and translocated to the periplasm vis the CcmABCD comples, and attached to CcmE via CcmC though its vinyl-2 group. The heme chaperone CcmE conveys heme to the ligation complex to catalyze the two thioether bonds, first between the C-terminal Cys and vinyl-4 and then the N-terminal Cys and vinyl-2 of heme yield sterospecific covalent hem ligation to apocytochrome c. Matured cytochrome c then undergoes folding to reach its native and functional form. Microbial Energy Transduction: Genetics, Structure and Function of Membrane Proteins. 1986. D. C. Youvan and F. Daldal, Eds. Cold Spring Harbor Laboratory Press, NY., USA. The Purple Phototrophic Bacteria. 2008. C. N. Hunter, F. Daldal, M. C. Thurnauer and J. T. Beatty, Eds. Springer, Dordrecht, The Netherlands. Ekici, S., Turkarslan, S., Pawlik, G., Dancis, A., Baliga, N., Koch, H-G. and Daldal, F. (2014). Intracytoplasmic copper homeostasis controls cytochrome c oxidase production. MBio, 5: 1055-13. PMID: 2445735. Verissimo, A. F. and Daldal, F. (2014) Cytochrome c maturation: an intricate process catalyzed by a supercomplex? Biochim. Biophys Acta Bioenergetics, 1837: 989-998. PMID: 24631867. Yildiz, G. G., Gennis, R. B., Daldal, F. and Ozturk, M. (2014) The KC-channel in the cbb3-type respiratory oxygen reductase from Rhodobacter capsulatus is required for both chemical and pumped protons. J. Bacteriol. 196: 1825-1832. PMID: 24563037. Trasnea, P-I., Utz M., Khalfaoui-Hassani, B., Lagies, S., Daldal, F. and Koch, H-G. (2015). Cooperation between two periplasmic copper chaperones is required for full activity of the cbb3-type cytochrome c oxidase and copper homeostais in Rhodobacter capsulatus. Mol. Micro. 100: 345-61. PMID: 26718481. Vos, M. H., Reeder, B. J., Daldal, F. and Liebl, U. (2017). Ultrafast photochemistry of the bc1 complex. Phy. Chem. Chem. Phys. 19: 6807-6813. PMID: 28218331 and correction. Tropeano, CV., Fiori, J., Carelli, V. Caporali, L., Daldal, F., Ghelli, AM and Rugolo, M. (2018). Complex II phosphrylation is triggered by unbalanced redox homeostasis in cells lacking Complex III. Biochim Biophys Acta Bioenergetics, 1859: 182-190. PMID: 29269267 and corrigendum.